i finished this little guy today.. it looks better in person, though.. and started another bigger strata painting with an ammonite. 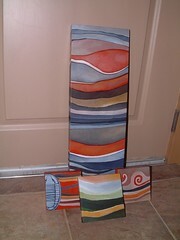 10 x 20 inches. i did not really think of it much at the time but it was appropriate to be working it while watching a documentary on the K-T boundary, the layer of earth that marks the end of the Cretaceous and the start of the Tertiary Era. Also there a many animals and plants that went extinct at this time - more than 75% of animal species. not everyone agrees on exactly how this scenario unfolded, but most people now generally agree that there was a large asteroid impact at the time and that led to various climate changes that meant an end to the dinosaurs - well, the non avian dinosaurs that is. birds are descendent from small dinosaurs, so you could say they are still with us in some form. 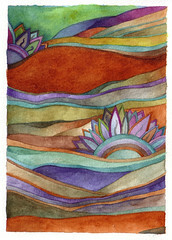 this is one of my new paintings. 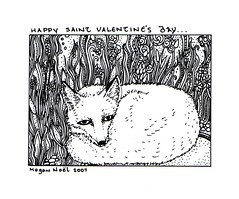 it is 5 x 5 inches. it's called worlds within. 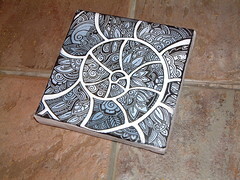 it was inspired by the inside of an ammonite or nautilus shell. Internally, the shell divides into camerae (chambers), the chambered section being called the phragmocone. The divisions are defined by septa, each of which is pierced in the middle by a duct, the siphuncle. As the nautilus matures it creates new, larger camerae, and moves its growing body into the larger space, sealing the vacated chamber with a new septum. anyway, i like the idea that each chamber for a time is the nautilus' world, and later is replaced by another, slightly larger world. but the earlier worlds are still with it. so maybe invertebrates are not so different from us humans in some ways, afterall. anyway, so my interest in geology / paleontology / archaeology coupled with audin's interest inspired this painting, which inspired the whole series. And if you want to know more about my mad scientist friend, look for a link to his blog "angry viking" in my sidebar. Maybe I should mention that audin is a norwegian name derived from odin, who is the king of the gods in norwegian mythology. if you are familiar with wagner's ring cycle, odin is the same was wotan. oof. i stayed up too late, painting. 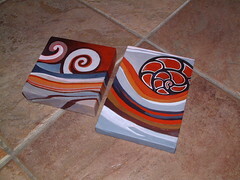 these are inspired by ammonites, ancient relatives of the squids and octopuses. imagine herds of these creatures, drifting through the seas of the triassic and cretaceous.
" Their name came from their spiral shape as their fossilized shells somewhat resemble tightly-coiled rams' horns. Pliny the Elder (d. 79 A.D. near Pompeii) called fossils of these animals ammonis cornua ("horns of Ammon") because the Egyptian god Ammon (Amun) was typically depicted wearing ram's horns"
2 stata paintings.. almost done! i did not paint last night which makes me sad. i was so tired so i just read. i'm still tired today, though. i am not sure if i will get to paint tonight. i have some ideas i want to look into incorporating into this series.. more fossils, canyons and canyonscapes, cliff homes (like anasazi and also like cappadocia in turkey), dreamtime, aboriginal dot paintings, and petroglyphs (both aboriginal and native americal) - i don't want to just jump onto another culture's band wagon, though, so i have to figure out how to make it my own interpretation... i like the idea of dreamtime. i had a dream a long time ago about a house that had wide front steps leading up and they were painted like an australian dot pianting, walking up them into the house felt like entering something. but now i need to go enter some data. 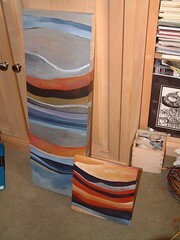 I have been painting a lot lately, on the Strata Series, which I have been working on for a while now. 2 years maybe? I've sold a few and given a few away so I am trying to get a pretty cohesive body of work pulled together so I can hopefully show them someplace. 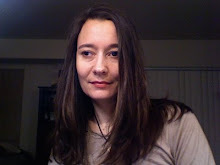 I got the paintings, or at least I am working on them, then will come finding a venue, which since I am basically a hermit artist will be the hard part for me. Most artists are not very good at marketing themselves and I am no exception! the trilobite painting is done! i wish i was better at taking pictures of these. maybe i should try scanning. i am just not getting the subtle details! 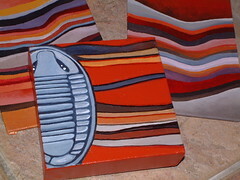 still, anyhow, my little trilobite paintings is done and i have more paintings in the "strata" series in process. 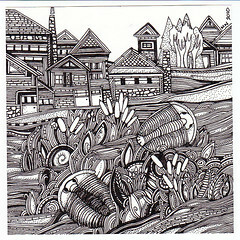 the trilobite is little, just 4x4 inches, acrylic and ink on canvas. we are having what the local weatherman calls "the 1st sunny weekend since August." it certainly does my heart good! 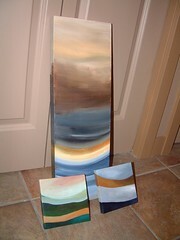 painted this morning and some new paintings i am very excited about. soon jesse and i are out to walk about ballard a bit and enjoy the weather! i <3 sun! this is what i am working on now, though they have progressed a bit since this photo was taken. i want to paint all the time. every day. right now. 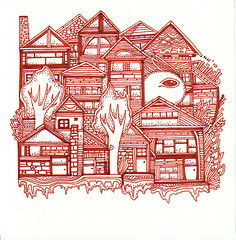 but i have some other people's art to go catalog. i went to daniel smith's recently and bought a PILE of canvases, which is rather exciting. 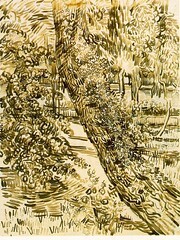 "In The asylum garden below, Vincent paints paints paints, burning with a fire of unknown origin." i recently watched a documentary i had had in my netflix queue for some time and i am quite pleased i did. 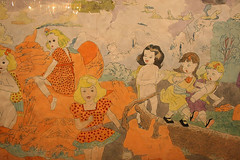 i was already familiar with henry darger's work and knew he was a reclusive outsider artist, but the details are so fascinating. this quiet mild mannered man came home from his janitorial job every night and wrote and created artwork - actually created his own world. After he died his landlords discovered a 15,145-page, called The Story of the Vivian Girls, in What is known as the Realms of the Unreal, of the Glandeco-Angelinnian War Storm, Caused by the Child Slave Rebellion. The documentary is fascinating and I recommend it. The creator, Jessica Yu, did a wonderful job, in the absence of much material to work with outside Darger's work itself -- he had no living relatives, no close friends, etc. 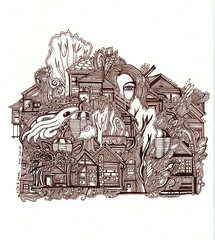 i did a lot of pen and ink drawings this week, sort of my sanity after a challenging day at work! 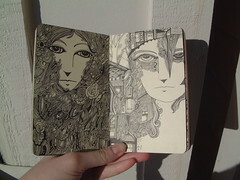 but i was too tired to scan any until last night. i listed some on etsy - birds, nests, houses, and trilobites! acrylic paintings are so hard to photograph. these look better in person. i took the day off work - a week earned vacation day - and in spite of feeling pretty poorly i worked on 4 paintings, 3 of which are shown here. it's been a challenging work week - both hard on my body physically and mentally. it was good to have a day off. i intended to work in greens but greys and browns took over. 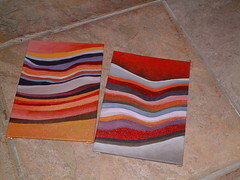 i might go in search of more canvases today. 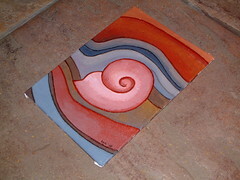 this one, 5 x 5 inches, was done under the influence of Edgar Rice Burrough's At The Earth's Core. Which borrows heavily from Jules Verne's Journey to the Center of the Earth. I have been listening it on Librivox, which I recently discovered. It's pretty neat - free audio books! books in the public domain read by volunteers. you can listen or volunteer at their website. I think At the Earth's Core is a bit silly, but then I am not the target audience, a young man reading adventure novels in the early part of the last century. (It was originally published in 1914.) Anyway, I continue my journey down Paleontology Lane. laura ingalls wilder. how many people can say they were inspired by laura ingalls wilder and jules verne IN THE SAME PIECE? 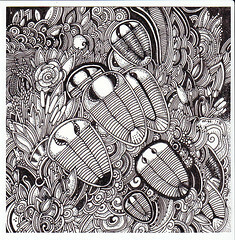 anyway, it, and another trilobite geeky drawing, are on Etsy. see my previous post, too. Ryan Henry Ward is an artist who has painted all over walls, cars, and buildings in Seattle. I love his art! And I bought one of his paintings today. 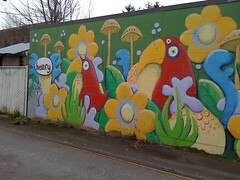 Here are more of his murals, as seen on Flickr. also when i was buying it, at short stop coffee in seattle, henry was there with his dog. 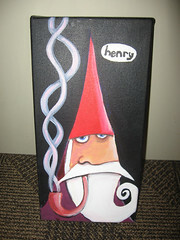 i told henry he looks like a gome. i meant it in the good way, hope he took it that way! his dog has endearingly large paws.